The family of a 17-year-old boy have spoken of their lives being "ripped apart" on the one-week anniversary of his death. Liam Hunt was attacked in St George's Street, Northampton, at about 17:00 GMT on 14 February. Five people have been charged with murder. Liam's family said in a statement: "We are devastated and there is nothing but a massive void left in our lives. We as a family have been ripped apart." They added: "Our boy was no angel, but we loved him more than words can express. Liam did not deserve to die the way he did. "No child should be taken from their family this way." The statement continued: "Liam had his entire life ahead of him until he was so cruelly taken from us. "All we ask is that if anyone has seen or heard anything, no matter how small or seemingly irrelevant, please contact the police and help us get justice for Liam." 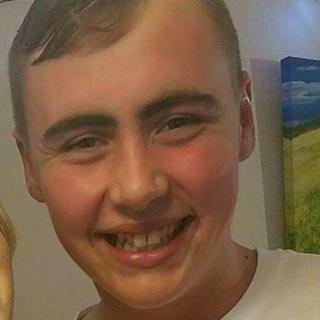 Det Insp Phil Mills, said: "It has now been one week since Liam died. I want to get our officers out there to show the community we are doing everything we can and to also remind people that, although arrests have been made, we still need anyone with information to make contact with us." All five people accused of murder were remanded in custody after appearing at Birmingham Crown Court on Tuesday. Four boys aged 16 and 17, who cannot be named for legal reasons, and James Dodd, aged 18, of Sentinel Road, Northampton, are next due to appear at Northampton Crown Court on 19 May. A sixth suspect, a 20-year-old man, was arrested on Tuesday on suspicion of murder.